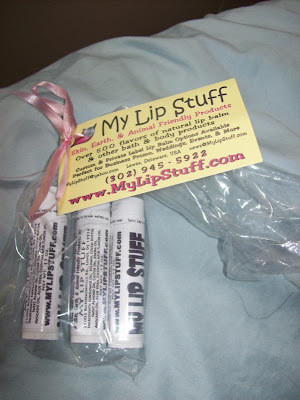 My Lip Stuff sent me three tubes of their amazing lip balm for review. Let me tell you that this is the best smelling lip balm that I have ever used. I was sent sangria scented, blackberry buttercream, and a coconut scented one. They all smell delicious! Also, they are skin, earth, and animal friendly products. They literally have over 500 flavors!!! It is all natural, can be personalized or customized, and is very affordable. This is a great product and I am very excited to be able to do a giveaway. Giveaway: My Lip Stuff will be giving away 6 random scents of their lip balm to one lucky winner! The giveaway is open until Midnight on Wednesday August 25th. Winner will be chosen on Thursday August 26th using Random.org. Also, the giveaway is open WORLDWIDE. Mandatory: Tell me the scent of lipgloss on My Lip Stuff that you want to try the most! YOU MUST LEAVE YOUR EMAIL ADDRESS IN EACH COMMENT SO I KNOW HOW TO CONTACT THE WINNER. Also, extra entries must be left as a separate comment. -Subscribe to my blog (1 entry) and leave a comment telling me you did so. -Add me to your blogroll and leave the link where it is (2 entries). -Subscribe to my blog through email (1 entry) and let me know you did so. -Blog about this giveaway (1 entry each time) and leave the link where you did so. -Tell me how you found my site (1 entry). -Enter my other giveaways and let me you did so (1 per other giveaway entry). -Put my button on your blog and leave me the link where you did so (3 entries). I would love to try carmel sundae! I'd try Dr. Pepper or Apple Cider - too many to choose from!! I would love to try the carmael apple scent. I found your blog through a trio of boys. I entered your Beyond the Shaker Gourmet Salt Giveaway. I entered your Lipo in a Box giveaway. I would like to try sangria... and so many more! I subscribe to your blog. I entered your Cafe Don Pablo Coffee giveaway. I found your blog on another blog. I also entered for the mangroomer. I'd like to try the cream soda lip balm! I entered your lentil chips giveaway! I found your site after you commented on mine :-). so fun! I want to try banana nut bread! I found your site via email that you sent out. I entered your gourmet salt giveaway. I want to try Banana Nut Bread Flavour!!! I found your blog through 'Mediterranean Snacks' site on Facebook. I would love to try the Strawberry Dream Pie lip balm. I found this giveaway by doing a search on Swagbucks! I would like to try coconut cream the most. I would love to try the after dinner mint flavor. I found you through This for That at My Ten Talents. I entered the Cafe Don Pablo Coffee giveaway. i found you through email. Peanut Butter Banana sounds great! You left a comment on my running blog. Entering your other giveaways! Thanks. Entered the dried fruit giveaway! So many yummy sounding flavors...think I'd have to try the Chai! Thanks for visiting my site, I'm your newest follower! The scent I'd like to try is cream soda. I found your button on the One To Try Linky. I entered your $32 Neostrata Foaming Face Wash giveaway. I entered the Zehn Naturals T Shirt. Found out about your blog on f.b from another persons post. I would really LIKE to try the Tiramisu. The peach flavor sounds good! I subscribed to your blog via Google Reader! Entered the Bergan dog harness giveaway! Found your blog from the Paws to Click Facebook page! Entered the lentil chip giveaway! Entered the Peeled Snacks giveaway! Entered the Fantasy Jewelry Box giveaway! Entered the Emma Rose Ruffle Wristlet giveaway! I'd love to try strawberry banana! I also entered your tweezer giveaway! found your blog after you started following me! Please leave me a comment and let me know what you thought of this post! I read and appreciate all comments. I'm a registered dietitian and blogger living in Metro Detroit, Michigan with my husband Troy, kids Adalyn and Oliver and 2 dachshunds! The Nutritionist Reviews is a blog that follows my love for creating healthy recipes, trying new products, nutrition, fitness & parenting. The Nutritionist Reviews © . Designed by "Templates by Kate".